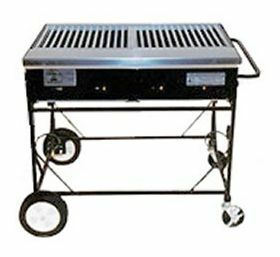 The COUNTRY CLUB SERIES features a large, portable heavy duty gas broiler with an attractive combination of stainless steel and wrought-iron work. The entire firebox and work shelf are constructed of Type 304 Stainless Steel. 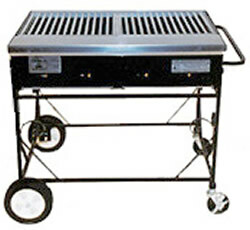 The free standing units are equipped with rubber tire wheels for easy moving and feature quick connection for either natural gas or propane gas. All models are complete with lava rock and a stainless steel drip pan. Width, left to right: 38"
Cooking Area: 16 1/4" x 32 1/4"
Cooking Area, sq. in. : 528 sq. in.